Want to make sure your camcorder doesn’t get tuckered out before you do? Check the battery’s mAh (milliamp hours) rating—you’ll usually find it listed in the specifications or manual. The higher the rating, the more charge the battery can hold. To extend the life of your battery while shooting, use the viewfinder instead of the LCD screen, and avoid the temptation to play back recently shot footage. If you’ll be shooting for a long time, consider buying an extended-life battery. These larger, heavier batteries cost $50 to $100 and can double a video camera’s battery life. If you are really roughing it, get a solar charger such as the $279 Brunton SolarRoll 9. Do you have old VHS tapes that you’d like to digitize? If so, look for a camcorder with an analog video input. This plug lets you turn your camcorder into a video converter. Just connect your VCR to the video input and record the video to the camcorder’s digital tape. When you’re done, connect the camcorder to your Mac and import the video into iMovie. For a step-by-step guide to converting old movies, see From Tape to DVD. If you mostly take photos but occasionally want to capture video, you may be better off investing in a high-quality digital still camera that also records video. You can download this video—which is usually saved as QuickTime or MPEG-4 files—directly into iMovie and edit it as you would any other video footage. Just keep in mind that video quality varies from camera to camera. For best results, look for a camera that captures video at a resolution of 640 by 480 pixels and a frame rate of 30 fps. It should also have a microphone on the front for recording audio with the video. Of course, the video from even the best still camera isn’t as good as what you’d get from a dedicated camcorder—camcorders have better microphones that can record stereo sound, and they tend to produce smoother video. But a good still camera should be adequate for the occasional clip. 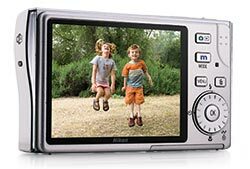 If you’re looking for a true hybrid device, consider a flash memory camcorder such as the $500 Sony Cyber-shot M2, which records both 5-megapixel still images and video to flash memory cards. Although not as good as their dedicated cousins, these hybrid devices do an admirable job of capturing pictures and video, and they’re small and easy to carry. While you’re at the store, don’t overlook these digital video essentials. Tripod A decent tripod holds the video camera steady, resulting in sharper video and smoother movement. 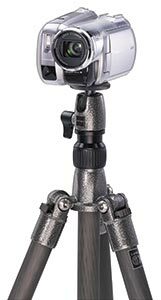 If a tripod is too heavy, consider a monopod. Though smaller and lighter, this one-legged tripod provides a steady platform. Carrying Case Camcorders aren’t cheap. Keep yours protected by investing in a good carrying case. Spare Battery Although relatively inexpensive (most are about $30), a spare battery can save the day by acting as a backup if you run out of juice halfway through a shoot. Just remember to keep it charged. Wide-Angle Adapter Camcorder manufacturers focus on making their zoom lenses longer, which can make it harder to get the whole picture. A wide-angle adapter makes it easier to take group portraits, for example. Head-Cleaning Tape A grungy recording head can lead to glitchy video. To prevent this, run a head-cleaner tape through your camcorder every couple of months. If you get back from your trip and find that your video doesn’t look or sound as good as you thought, don’t panic. iMovie HD includes a number of filters that can correct common problems. Noise Reduction The Noise Reducer feature filters out annoying background sounds while preserving important stuff such as voices. To access it, click on iMovie’s Editing button, select the AudioFX tab at the top of the window, and select Noise Reducer from the list of effects. Move the slider to the right to be more aggressive in removing noise. Use the Preview button to test the results. Fix Colors For video that is too dark or too light, try iMovie’s Brightness & Contrast filter, which adjusts the video’s exposure. To correct for a color cast (for instance, if you moved from outdoors to indoors without adjusting your camcorder’s settings), try the Color Adjust filter, which shifts the video’s color balance. For example, drag the Hue control to the left if your colors look too green, or to the right if they look too red. You’ll find both filters in the VideoFX section of the Editing pane. They can’t work miracles, but they can do an effective job in many cases. You’ll get far better sound from an external microphone. But to connect one of these mikes, you’ll need a camcorder with a microphone input (in most cases, it’s a 1/8-inch stereo minijack, although some camcorders have their own proprietary connections).